There is no doubt that tendon problems can be among the most frustrating injuries for people. Because tendons attach muscles to bone, tendon problems can therefore interfere with movements all over your body from lifting your arm (Rotator Cuff tendinopathy), to holding an object (tennis elbow) to walking (hip tendinopathy), to squatting (knee tendinopathy) and even to pushing off your foot (Achilles tendinopathy). However, new research from Sydney and Glasgow is uncovering what is really going wrong with tendons and how well designed physiotherapy can deliver better outcomes than surgery. Tendinopathy literally refers to tendon pain. It can be extremely debilitating, with at least 40% of all general practitioner consultations involving a tendon problem. Historically, tendon problems haven't been treated very well because the underlying disease process wasn't very well understood. The typical person who tends to suffer from tendon problems is a person in their mid 40's to 50's who is moderately active. Initially, they experience pain following an activity which then becomes more constant often waking them from sleeping at night and worse at the end of the day. With probing questions, it is often discovered that the pain is related to a repetitive movement. Classic examples of repetitive movement as the cause of tendinopathies include prolonged swimming, playing guitar or painting for shoulder tendinopathies, using the mouse, pruning and knitting for elbow tendinopathies and walking or running for Achilles tendinopathies. We've known for 30 years that instead of the tendon being pristine, white, type I collagen which is as strong as steel, the injury has transformed it into the more ragged, greyish, weaker and painful type III collagen. The only problem is that we haven't known why, until recently when it was discovered that the switch for dialing up or down type III collagen becomes dis-regulated. What the recent research has shown, is that it is mechanical tension or specific strengthening exercises that can re-regulate this switch. The question is how much and how often should exercises be performed for optimal adaptation. Too little and the tendon degenerates (use it or lose it). Too much and the tendon breaks down further. Professor Jill Cook at Latrobe University has shown that isometric exercises (strengthening exercises where the muscle develops tension but there is no movement of the joint) performed initially have been shown to reduce tendon pain and begin the process of remodeling the tendon. What you need to do to get better and return to the activities that you want to do. However to return to the sports and activities that you want to do, requires a whole lot more than just strengthening the tendon in an isolated way. Yes, you need to strengthen the tendon so that it can tolerate forces above and beyond the stresses that it will be placed under. But more than that, you need to strengthen associated muscles, correct sports and functional technique and finally you need to improve the tendon's endurance, so that it can tolerate these forces over and over again. Failure to complete this extensive rehabilitation will result in just short term pain relief from your pain. It is simply physics. You cannot load a tissue beyond what it has been trained to tolerate and expect it not to break down. If you suffer from shoulder, elbow, hip, knee or ankle tendon problems and would like some help to get rid of your pain and to return to activities that you love to do, call us here at Bodywise Health on 1 300 BODYWISE (263 994) for a Complimentary, No Obligations Assessment and Recovery Action Plan. In your Complimentary, No Obligations Assessment session you will learn what the source and cause of your pain is and develop a Recovery Action Plan that will deliver you the best results in the shortest amount of time. * How to prevent the reoccurrence of your injury. * What improvement to expect and when so that you can monitor your recovery and know that you are on track to achieve your goals in a forecast timeline. If you have not achieved results in the past and you want to overcome your injury and pain once and for all so that you can get back to doing the things that you love to do, call us here at Bodywise Health on 1 300 BODYWISE (263 994) and take the first step to getting better, moving on from your pain and enjoying life. * For complex or chronic conditions, you may qualify for the EPC (Enhanced Primary Care Program) allowing you to receive 5 allied health services each calendar year with a referral from your GP. For more information, please call Bodywise Health now on 1 300 BODYWISE (263 994). Bulging Disc? Sciatica? Lower Back Pain?Here's how to Achieve Lower Back Pain Relief. Just hearing the words bulging disc, herniated disc or sciatica is enough to strike fear into the hearts and minds of all people. And rightly so, as a bulging disc or disc herniation causing sciatica can be an extremely debilitating and painful condition and if not treated correctly, can have a most disabling effect on your life. When describing this condition, it is not uncommon to hear people say that they have a "slipped disc" and have put their "back out". Whilst this is an incorrect over-simplification of this condition, it does suggest that something has slipped 'out' and needs to be pushed back "in". What this refers to is the inter-vertebral disc which can be a potent source of low back pain as they bulge, tear and split. So what is a Bulging Disc or Herniated Disc? Except in the cases of paraplegia or quadriplegia, it is impossible for a person to 'put their back out' as the vertebral bodies of the spine are held together by an inter- vertebral disc. This disc acts as a cushion and by deforming in all directions allows the spine to bend in all directions. In the middle of this disc is a paste/gel like substance called the nucleus pulposus. This substance acts as a fulcrum for movement and as the disc deforms, it evenly distributes the forces throughout the disc. Enveloping this nucleus is a fibrous casing called the annulus fibrosis. Research has shown that there are only two degrees of motion at each level between the 1st and 5th lumbar vertebrae and five degrees between the 5th lumbar and 1st sacral vertebrae. (Sahrmann 1997). Movement beyond this has been shown to result in tearing of the disc. Consequently, repeated minor trauma such as with bent, rotated postures may cause circumferential fissures in the annulus. As only the outer layers of the annulus receive a nerve supply, for a disc to become painful, a lesion must involve the outer third of the annulus. These defects then provide a potential pathway for the nucleus to seep into, causing the disc to bulge, split, tear and seep out. By a person's 30's, the nucleus pulposus tends to dry out and consequently true herniations tend to occur in people in their 20's (Bogduk and Twomey 1991). However, disc bulging in the older person can occur due to degeneration of the nucleus and failure of the annulus. Again this pathology is usually associated with repeated poor postures and movement patterns and can lead to spinal canal stenosis, an important source of low back pain. The most common age for disc prolapses to occur is in the 25 to 45 year old age group. It more common in males at a ratio of 3:2 with the most common site for prolapse being between L5/S1 (46.4%) and the L4/5 disc being the most common transitional area (40.4%). 1. Poor posture and movement patterns, leading to increased joint strain, wear and tear and eventually fatigue. 2. Poor equipment and work station setup. The size, severity and direction of the disc injury as well as the associated structures affected, will determine the presenting signs and symptoms. Herniated discs may occur suddenly or gradually, as a result of a single major traumatic event or as the result of some minor event. Stories such as "I bent over" or "I reached forward" are not uncommon and are often associated with a dull ache or knife like pain either in the midline or off to one side. The lower back pain may initially be intermittent, but is worsened by sitting, bending and coughing/sneezing and often disturbs sleep. Generally, it is confined to the lower back region, but later may radiate into both or more often one leg. The distance of radiation is more indicative of the severity of injury rather than the structures involved and whilst irritation of the sciatic nerve cause pain, direct pressure on the sciatica nerve results in numbness, tingling, weakness and loss of reflexes. Whilst x-rays do not show soft tissue damage, they may indirectly show the effects of a prolapsed disc, by the presence of deformity, joint mal-alignment and flattening of the disc. Myelography, CT or MRI scans may also reveal a disc bulge or herniation. Whilst pain associated with facet joint strains tends to be specific and isolated, disc prolapses pain tends to be more vague and diffuse. Bending which tends to aggravate disc prolapses tends to relieve pain associated with a spinal canal stenosis or spondylolythesis. In contrast, arthritic movements tend to be limited in all directions. Treatment of acute disc injuries will vary with the severity and extent of the person's symptoms. A bulging disc with or without sciatic nerve involvement, treatment may include short term bed rest, electrotherapy, traction, graduated mobilization as well as a prescription of extension exercises and sometimes the use of taping or a back brace. These may be used in conjunction with anti-inflammatory medication to provide further relief. It is important to avoid any movements or positions which aggravate your pain. McKenzie exercises may also be given along with 'hands on' and dry needling techniques to assist with pain reduction or to restore the mobility and promote an environment of healing. Tissue healing may be further promoted through the use of electrotherapy, massage, joint and sciatic nerve mobilisation as well as back pain exercises to give sciatica pain relief. Spinal mobilisation and manipulation be combined with precise stretching and trunk stabilisation exercises to normalise spinal mobility and core control. As improvement continues, stabilisation is progressed from slow, controlled contractions to faster and more automated activities to more approximate lifestyle conditions. Both strengthening and aerobic conditioning may then be built on top of this stabilisation base to give maximum protection against re-injury as well as to facilitate a higher level of physical performance. Finally, lifestyle components such as work / home environments, equipment, as well as habitual movements and postures must also be addressed if optimal function is to be achieved and injury recurrence is to be minimised. To learn more as to how Bodywise Health can help you overcome back pain or for an appointment, please call Bodywise Health on 1 300 BODYWISE (263 994). For complex or chronic conditions, you may qualify for the EPC (Enhanced Primary Care Program) allowing you to receive 5 allied health services each calendar year with a referral from your doctor. For more information, please call Bodywise Health on 1 300 BODYWISE (263 994). Worried About How Your Child Walks or Runs? Are you worried about seeing your child's toes point inward as they stand or walk? Whether you should be depends upon the cause of toe in postioning as well as the age of your child. Pigeon toe or toe in walking is a common and often painless condition for children. Very often, it occurs in one or both feet in children under the age of 2. The condition usually corrects itself with no intervention. This type of pigeon toe often develops in the womb or is due to genetic birth defects, so little can be done to prevent it. Contrary to popular belief, there are no known shoes or orthotics that help prevent pigeon toe and no evidence to suggest that learning to walk in bare feet has any effect on the condition. Pigeon toe may develop in the womb and often corrects itself. With metatarsus varus or metatarsus adductus, the front of the foot is angled inward giving the foot a curved, half-moon appearance. This type of pigeon toe is common in babies who were breech in utero or whose mothers had less amniotic fluid. Occasionally, there is a family history of the condition. Normally, the foot is abled to be straightened out by a doctor or healthcare professional once the child is born with no further treatment generally being required. Although its not imperative, a parent can also gently stretch the baby's feet a few times a day to help correct the shape. Internal tibial torsion refers to the inward twisting of the shin bone or the tibia. This twisting of the shin bone often becomes noticeable as a child first begins to walk. It is generally not painful, but parents of children with internal tibial torsion tend to report that their child falls frequently. Like metatarsus adductus, the condition often resolves without the need for therapy, bracing or casting. Sometimes however, in more severe cases and / or the shin does not straighten out by the time a child reaches 9 or 10 years of age, internal tibial torsion may require surgery to fix it. The procedure involves cutting through the twisted bone and reattaching it to make the foot straighter. This type of toe in positioning is very common affecting up 10 percent of children. Here, the thigh bone (femur) is excessively rotated inward in the hip joint. It is thought that this may be due to stress to the hips before birth. Normally this type of in-toeing resolves by the age of 8 years. If it continues after this age, an examination by a physiotherapist, doctor or other paedicatric health care professional is recommended to assess what might be the best course of action to correct the toe in positioning. Occasionally the neck of the thigh bone is angled in such a way as to increase the turning inward of the leg. At other times, this type of toe in standing and walking may be purely a habit that can be corrected with making the child aware of the fact that their feet are turned inward. Generally there is no urgent need to see a physiotherapist or doctor. However, if the toe in position is still apparent by the time your child reaches 8 years, or if it causes your child to fall more often than normal, a physiotherapist or doctor should be consulted. Diagnosis for pigeon toe can often be determined by a comprehensive physical examination. Occasionally, X-rays and other imaging may be necessary. For metatarsus varus or metatarsus adductus, diagnosis is generally made very early, often during the newborn's post-birth examination. A skilled physical examination will identify that the positioning of the foot bones are cause whilst ruling out out other possible causes such as mal-alignment of the hip joints. Internal tibial torsion generally apprears only as a child begins to walk and so the earliest diagnosis may be slightly before 1 year of age during a physical examination of the infant's legs. If diagnosed, the physiotherapist or doctor will take measurements of the legs. Femoral anteversion is most often diagnosed when the child is between the ages of 4-6 years. This will normally start with a physical examination and a review of the medical history of the child and family. Specialized therapy that involves specific stretches and targeted activities that encourage the correct positioning of the feet during standing and walking. These activities often involve strengthening of the outside muscles of the hip and improving balance so as optimise walking and running. Finally surgery may be recommended as a last resort to correct the positioning of the bones that cause pigeon toe. To fix these issues does require a comprehensive, co-ordinated approach. It is essential to assess whether there are any structural limitations or deficits preventing these children from walking correctly. Do they have an arched or flat back? Are their hips stiff? Are they knock kneed or bow legged? Do they have flat or highly arched feet? Already these children's bodies have begun to adapt to this way of walking. This means that they are likely to have poor core stability, their outside hip muscles are likely to be stretched and weak, whilst their hamstrings and the muscles on the inside and outside of their thighs are likely to be tight and dominant. Their ankle joints are also likely to be stiff, their calf muscles tight and their foot muscles and plantar fascia weak and overstretched. These children are also likely to have poor balance which requires that they walk with their feet wide apart making ambulation inefficient and tiring. Correcting these kids walking pattern is easier said than done. Ultimately, it means loosening stiff joints, strengthening weak muscles and stretching tight soft tissues. It often requires balance retraining and learning to walk with feet less wide apart and a correct heel - toe contact. Taping, bracing and orthotics may all be useful in assisting and accelerating the rate of improvement. Whilst all these interventions and techniques may sound over-whelming, they can be integrated into a concise, targeted program that usually delivers results within four weeks. It is worth it. Incorrect walking can cause a multitude of problems over your child's life culminating in multiple joint replacements. It can cause children to be less active, less engaged and less connected. It can lead to a decrease in sports achievements. However, most devastatingly it can take away opportunities and limit your child's potential. If you do have any concerns regarding your child's posture or movement including the way that they walk, please call Bodywise Health on 1 300 BODYWISE (263 994) for a free examination and advice. It may save them a life time of physical and social problems. X-rays, ultrasound, CT and MRI scans can be very valuable for identifying serious medical conditions such as fractures, spinal cord injuries and other specific lesions. However, once "serious problems" are ruled out by a radiologist, evidence shows that minor findings may not just be of no value in helping to explain the majority of aches and pains, they may be psychologically harmful especially when they tell patients that they have arthritis, degenerative disc disease, disc bulges, tendon tears and more. Here are a few important facts regarding medical imaging that you must be aware of to prevent yourself being fooled by your X-Ray or diagnostic scan. It is well established that most imaging findings, particularly degenerative changes, correlate poorly with clinical presentation. 5. Spine MRI in primary care often leads to surgical assessment - yet MRI cannot discriminate surgical vs. non-surgical cases (You et al. 2012). Translation: Do not panic if your x-rays shows "problems" with your discs; they simply are normal changes that occur from the age of 20 onwards. Translation: Do not panic if your x-ray or MRI shows "problems" with your discs; they are simply common and NORMAL findings. An MRI study of healthy adults and seniors found that 98% of all men and women with no neck pain had evidence of "degenerative changes" in their cervical discs. There was also a recent study where they MRI'd the SAME patient in 10 facilities and got COMPLETELY different reports from all of them - not good! Translation: The majority of all healthy adults get neck degeneration (arthritis and disc bulges meaning they are a NORMAL aging process! Therefore, neck arthritis and mild to moderate disc bulges can only be a reasonable explanation of your neck pain if they match your clinical examination. Translation: Do not panic if your ultrasound and/or MRI shows a rotator cuff tear; it is not necessarily associated with your shoulder pain! Translation: Do not panic if your x-ray or MRI shows cartilage tears or narrowing; it is not a sign of permanent pain or disability. In fact, one study showed that 48% of professional basketballers had meniscal (cartilage) "damage" on their knee MRI's. Translation: Do not panic if your knee x-ray or MRI shows degeneration, arthritis or mild cartilage tears; it is NORMAL! Translation: One third of all people have a heel spur and yet have no pain. After reviewing this research you might be thinking that x-rays and diagnostic scanning are useless in identifying sources and causes of the majority of injuries and diseases. Not so. Diagnostic imaging techniques are valuable tools in assisting with diagnosis and healthcare management. However, x-rays and scans are just one set of tools that provide unique insights that must be considered in the wider context of physical assessment and evaluation, as well as the social, psychological, nutritional status of a person. Only when all these factors have been considered, can an optimal healthcare management plan be devised and implemented to achieve the best health outcomes possible for you. If you have an injury or pain that you would like to get better as quickly and completely as possible, please call Bodywise Health on 1 300 bodywise (263 994) and receive a no obligation, complimentary injury assessment and advice. In this session, you will discover the source and cause of your problem as well as the number one thing that you can do to help yourself get better. 1. Kendrick D, et al. The role of radiography in primary care patients with low back pain of at least six weeks duration: A randomised (unblended) controlled trial. Health Technol Assess.2001: 5(30);1-69. 2. Ash LM, et al. Effects of diagnostic information, per se, on patient outcomes in acute radiculopathy and low back pain. AJNR. Am. Neuroradiol. June 2008. 29 (6):1098-103. 3. Modic MT, et al. Acute low back pain and radiculopathy: MR imaging findings and their prognostic role and effect on outcome. Radiolog. 2005 Nov; 237 (2) 597-604. 4. Okada E, et al. 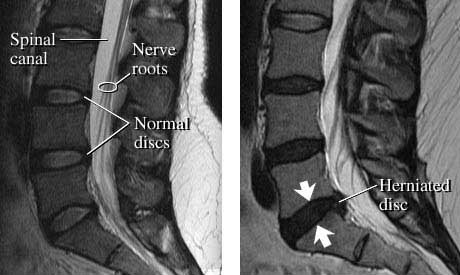 Disc degeneration on MRI in patients with lumbar disc herniation: comparison study with asymptomatic volunteers. Eur. Spine J. 2011 Apr;20(4):585-91. 5. Matsumoto M, et al. Prospective 10 year follow-up study comparing patients with whiplash associated disorders with asymptomatic subjects using magnetic resonance imaging. Spine. (Phila Pa 1976) 2010. Aug 15;35(18):1684-90. 6. Matsumoto M, et al. Age related changes of thoracic and cervical intervertebral disc. Spine. (Phila Pa 1976) 2010. Jun 15;35(14):1359-64. 7. Wood KB, et al. Magnetic resonance imaging of the thoracic spine. Evaluation of asymptomatic individuals. J Bone Joint Surg. Am 1995 Nov;77(11): 1631-8. 8. Cheung KM, et al. Prevalence and pattern of magnetic resonance imaging changes in a population study of one thousand forty three individuals. Spine. (Phila Pa 1976) 2009. April 10;34 (9):1934-40. 9. Takatolou J, et al. Prevalence of degenerative imaging among young adults. Spine. (Phila Pa 1976) 2009. Jul 15;34(16):1716-21. 10. Chou D, et al. Degenerative magnetic imaging changes in patients with chronic low back pain: A systematic review. Spine. (Phila Pa 1976) 2011. Oct 1;36 (21 Suppl):S43-53. 11. Chu Miow Lin D, et al. Validity and responsiveness of radiographic joint space width metric measurement in hip osteoarthritis: A systematic review. Osteoarthritis Cartilage. 2011 May;19(5):543-9. 12. Silvis L, et al. High prevalence of magnetic imaging findings in asymptomatic collegiate and professional hockey players. Am J. Sports Med. 2011 Apr;39(4): 715-21. 13. Bedson J, Croft PR. The discordance between clinical and radiographic knee osteoarthritis: A systematic search and summary of the literature. BMC Musculoskel. Disord. 2008 Sep 2;9:16. 14. Kaplan LD, et al. Magnetic resonance imaging of the knee in asymptomatic professional basketball players. Arthroscopy. 2005 May;21(5):557-61. 15. Johal KS, Milner SA. Plantar fasciitis and the calcaneal spur. Fact or Fiction? Foot Ankle Surg Am. 2012 Mar; 18(1):39-41. 16. Sher JL et al. Abnormal findings on magnetic resonance images of asymptomatic shoulders. J Bone Joint Surg Am. 1995 Jan;77(1):10-5. 17. Connor PM, et al. Magnetic resonance imaging of the asymptomatic shoulder of overhead athletes: A 5 year follow up study. Am J. Sports Med. 2003 Sep-Oct;31(5):724-7.